The Plitvice Lakes national park is a vision, filled with high wooded mountains and lakes of crystal blue-green water. This tranquil national park has an impressive collection of waterfalls and a gallery of sixteen lakes formed by natural dams of travertine. The wonders of Plitvice don’t stop at the scenery; the national park also has an incredible diversity of wildlife, from brown bears to hedgehogs, from birds to crayfish. Unsurprisingly, the Plitvice Lakes have been on the UNESCO World Natural Heritage list since 1979. This day on tour will be one of your most memorable; there is truly nothing else like witnessing the magnificent Plitvice Lakes. Croatia is a gorgeous country with beautiful vineyards producing exquisite wines. This tour provides you with the opportunity for tastings at some of Croatia’s best wineries. The region of Istria is famous for wine and truffles, and on this tour, you get to experience both. 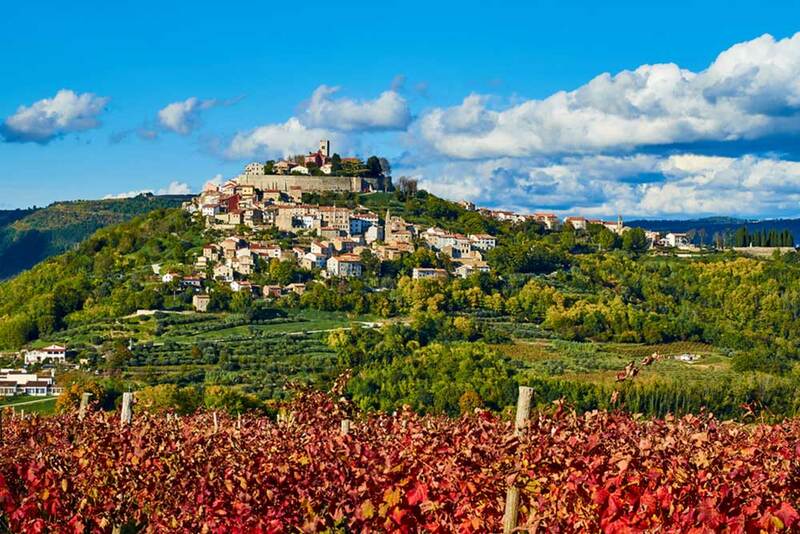 The hilltop town of Motovun is a small town but is rich with historical heritage. The park-forest of Motovun is the most famous place for truffles and you will have the opportunity to indulge in a truffle session, organised at the Zigante estate. Zigante tartufi is the leading name in truffle production and sales. The biggest truffle found weighed 1.31 kg and entered the Guinness Book of World Records. It was found by Mr Giancarlo Zigante on the 2nd November 1999 near Buje. The gastronomic delights continue as you make your way to the village of Vižinada, where you can enjoy a sumptuous wine and olive oil tasting. On day 6 of the tour, enjoy another exclusive wine tasting en route to Opatija. If you’re even just a bit of a wine connoisseur, you will love visiting these distinguished vineyards and experiencing Croatia’s culinary delights. Dolac Market is a picturesque open-air market offers an abundance of fresh fruit, homemade goods and colourful wooden toys. It is the best-known and most visited market in Croatia. Traders from all over Croatia come to the Dolac Market to sell their goods to the bustling crowds. Set on the border of Zagreb’s Upper and Lower towns, the market is a strong symbol of Zagreb’s heritage and has been operating since approximately 1930. Since then the layout of the market has remained the same aside from additions including a fish market in the mid 1930’s. The main market is on a raised square selling fruits and vegetables; whilst inside there is meat and dairy. The Dolac Market is a true highlight with so much activity and culture to witness in the one place. Don’t forget as part of the Gold Collection, there are a range of complimentary exclusive experiences included on tour. With every booking we’re also giving away a Canon zoom camera and Nikon binoculars.